Nadine Gordimer: Wise Words About Bettering A Troubled World : Goats and Soda She lived in a country where people suffered because of the color of their skin. And she had a knack for saying just the right thing to inspire us to stand up for all the world's needy souls. 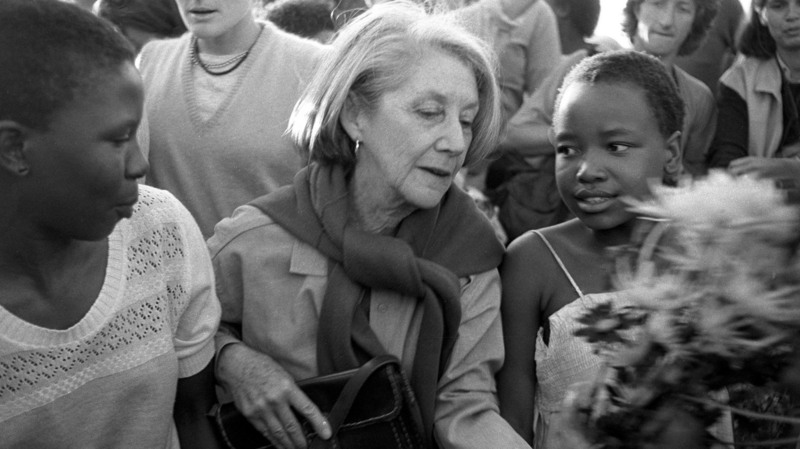 Nadine Gordimer visited Alexandra, the black township near Johannesburg, in 1986 to pay homage to victims of political unrest. The great novelist Nadine Gordimer, whose stories told of the immorality of apartheid in her beloved South Africa, has died at age 90. Gordimer was not only a writer. She was an activist in the fight to end apartheid. In her writings and speeches, the Nobel Prize winner offered words of enlightenment for anyone sharing her commitment to bring a better life to those suffering from prejudice, poor health, poverty, and other ills. "Perhaps the best definition of progress would be the continuing efforts of men and women to narrow the gap between the convenience of the powers that be and the unwritten charter." "The country of the tourist pamphlet always is another country, an embarrassing abstraction of the desirable that, thank God, does not exist on this planet, where there are always ants and bad smells and empty Coca-Cola bottles to keep the grubby finger-print of reality upon the beautiful." "There is no moral authority like that of sacrifice."